In June of 2018, after decommissioning The Node 804 build, I started looking around for a new case to house these old parts. Wanted: (1) mATX case that would hold a dual loop system. (2) Room above motherboard and memory blocks for a top mounted rad. (3) Room in the front of the case for my EK 280XTC rad with 2 Bitspower 150 mm reservoirs mounted to the fans in a pull configuration. OK, so that was not going to happen.Ended up going with a Corsair Carbide 275R midtower ATX case. Not because it could natively house this configuration but because there was enough room inside to be able to move the motherboard around. That is where the name of the build comes in. The motherboard will be mounted two expansion slots "Down" and because of the secondary plate behind the board, "Out" towards the window about 1/2". The case is fairly basic. It has one tempered glass side panel, a full length PSU shroud, big feet, and........that's about it. The area on the right side of the midplate is for mounting SSDs but if you install a rad in the front of the case, the SSD mounting screws will not be accessible. There is not very much room behind the midplate. 15mm in the motherboard area that increases to 25mm at the front of the case. Laid the case on it's side and placed the motherboard inside to see where it wanted to sit Lots of room in there. Made a new motherboard mounting plate out of .062" aluminum and laid it on top of the original standoffs. There are 6-32 x 1/2" standoffs attached to the motherboard. This shows approximately how far down the board has to go. After the new rear panel was attached to the case, the original standoffs were removed and the new motherboard plate was screwed to the midplate with 6-32 screws. There are 1/8" nylon spacers on the screws between the plates. Robbed the rear I/O bracket from the Node 804 and held it in place with the motherboard in order to get some measurements. The big feet have got to go. These are Lian-Li feet. The pieces of EK ZMT are for stabilizind them. Made a fan cover with an integrated cover for the I/O stuff on the motherboard. Picked up two 80mm fans from Arctic Cooling on Amazon.ca for $5.99 each. That is where I am as of today. Next comes mounting the pumps and tops. Great project. Coming along nicely. Very nice metal work going on. Very nice build indeed! I wish I could have a build like that where I can take my time with it but unfortunately I need to do it all over holidays booked off or a long weekend. Anyway fantastic build and photos! this is one of very few where I read every step and look at every photo carefully. What did you use by the way to cut the aluminum so nice on the rear IO plate? Thanks for the comments dknourek! Sorry in advance if I got carried away with the answer but I thought some of this might be of interest. When working with aluminum I just use some basic hand tools and if I have to, a jigsaw. I found that using a jigsaw with an aluminum blade usually creates a giant mess with cuttings flying everywhere, so I use one of these saw handles that takes a reciprocating saw blade. It cuts straight and very fast. When cutting holes for fans that are so close together, I use two pieces of plywood. Drill a 1/4" pilot hole in one and saw an appropriate sized hole in the other. Drill a hole in the work piece and place it over the hole in the backing board. Use a 1/4" pencil rod or just turn the bit around in the holesaw so that it doesn't chew away at the hole in the backing board. Push the pilot bit through the hole in the work and into the backing board. Slide the other board over top and clamp it all together. The top board keeps most of the cuttings contained and keeps the saw blade from wandering. Spray some water in there and you get kind of a slurry around the blade to keep it lubricated. Everything else is just file and sand, file and sand. Last edited by wattermain; 01-11-2019, 06:05 PM. It's so clean. I'm taking notes of the metal working parts... I really like your work. Keep it up. For sure, I'm planning 2 builds this year... 2 custom scratch builds. Can't wait to draw my ideas and show them in the forum! Had a bit of an incident. Seems my tape measure let me down.....again. All of the pass thru fittings in the PSU shroud were about 3mm out. They will all have to move so I figured that this would be a good time to address another issue that came up. There is not enough room between the motherboard and the reservoir for the ATX cable to pass through. Decided to move the fans around to the front of the rad and have them push air in. This would allow the reservoirs to be mounted to the rad and give me an extra inch of room for the ATX cable. Made the holes larger and knocked out another hole for the cable to the video card. This was going to be the original configuration of the pumps with the feed from the reservoirs going to the front of the pump top. Moved the feed from the reservoir to the top inlet. Made a new cover plate for the PSU shroud. 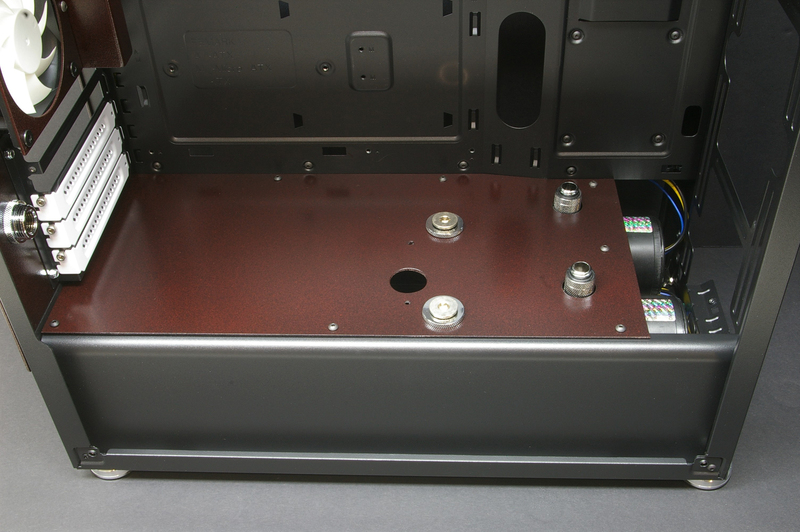 This will also hide the HDD cage mounting slots, the grill over the PSU, and the large cable management slot. Because of the extra height of the new plate, a couple of washers were added to each of the isolation feet. The adjustable M/M extension fitting from the rotary 90 to the pass thru was already maxed out. Inslalled the pumps in their new configuration. The Aquacomputer tops just manage to squeeze in there. Kind of glad that my tape measure screwed up. Looks a bit cleaner now. I know the pain very well, little mistake and things do not line up, nicely. Thanks Daz. I was lucky to be able to use plan B. Had more than enough times when stuff had to go straight to the curb.